Hire race nights for a great nights entertainment. The race nights are one of the best. We have a selection of formats for the race nights – the charity race night, here the guests play with real money and after paying the winners out the proceeds go to a charity or kids football club etc. then we have the corporate race night, usually played in teams or tables with fun money and there is a prize at the end for the winning team. Finally we have the deluxe race night, this is the full package, with race night theming, tote collectors, tote booth and all the extras. We ”hire race nights” throughout the UK and have quite a few comperes. All the race nights come with compere / pa system / projector / screen / tickets and programmes. All you need to supply is the guests. Hire race nights for your next party. We offer the standard race night packages and also the corporate race nights played with fun money. The company race nights are as exciting as the charity race nights and the fundraising race nights. We hire charity race night equipment to a wide range of clients. If you want to hire corporate race night fun we have all the backdrops / props and tote sellers for this package. The race night packages are great when you hire race night equipment. We hire fund raising race night packages all over the UK. The race nights for hire are always very popular. Our race night hire gives us the best UK race nights. 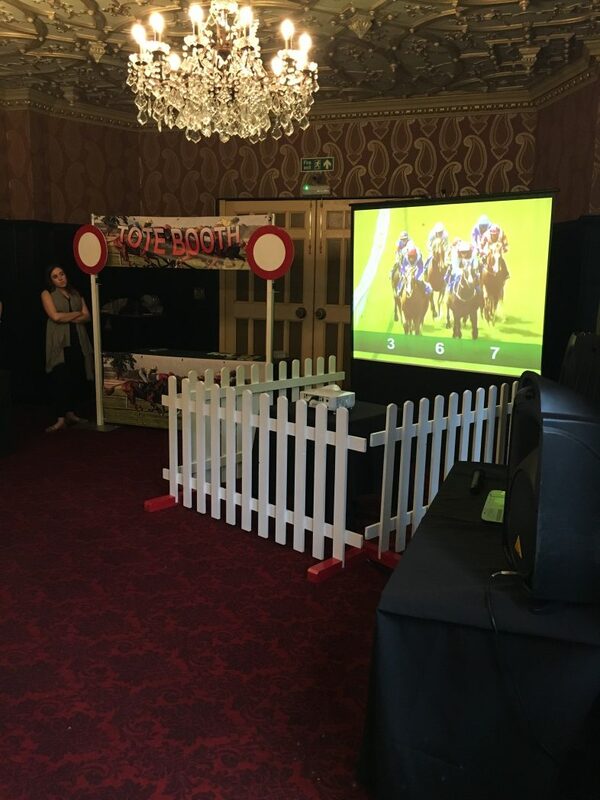 Hire race nights, it is great fun, you can keep many guests occupied and involved and they will all enjoy watching the races. For most race nights there are 8 races with 8 horses, you bet before you see the form so really it is a lottery. The race nights are legal fund raising events, and we have an information pack of how to maximise fund raising at your race night – call our sales team if you would like this or to talk through any race night queries you may have. Our race nights are some of the best around and we always get great feedback from the clients who book race nights. We hire race night packages to suit every budget.